CCI's Mini-Mag ammo is a whole step in quality above average 22 Long Rifle ammo that you may find searching for just the cheapest price. This ammo is well-known to reliably cycle almost any 22 LR firearm and they tend to have a lower failure rate than many of its cheaper alternatives. And yet, these rounds tend to be a much better value than the Olympic level ammo. 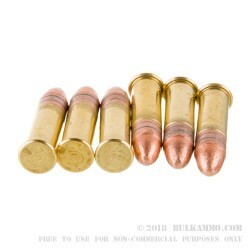 Rimfire ammo is made in a very unique way where a primer compound is dropped into the bottom of the case and the case is then spun to spread the primer compound to the outside of the rim before drying. Getting this process just right at a reasonable value is what seems to separate Mini-Mag ammo in its iconic 100 round individual plastic trays from much of the rest of the crowd. Finally, this ammo is loaded with clean-burning propellants helping to keep your action cleaner than many alternatives. This highly recommended ammo is loaded in Lewiston, Idaho. Great ammo. No misfires. Excellent price. I always use this ammo and Blazer. Both of them are made by CCI. It is the only bulk ammo my VERY picky High Standard target pistol will feed. Q: I bought this item of 5,000 rounds of CCI Mini-Mags. There were 50 plastic boxes of 100 quantity that came in a large cardboard box. The 100 quantity plastic boxes each have a barcode and the large cardboard box also has a barcode. Can I just send the original barcode that is on the cardboard box, rather than taking the barcode off all 50 plastic boxes? Thanks. A: Hi Dennis. You should be able to use the barcode from the case carton. This, along with your invoice, should suffice. You can visit Vista's Rebate page for more information. Q: How do get the rebate? Email sales promotion shows a price of $239.20 for 5,000 rounds with rebate. There isn’t a rebate listed on the CCI website. 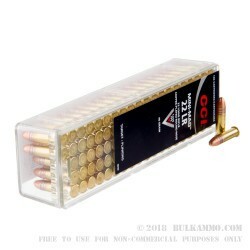 A: Yes, we offer this CCI 22LR 40gr CPRN in 100 round boxes as well. 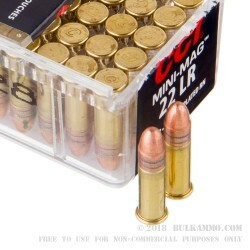 A: These CCI Mini-Mags are high velocity and should cycle most 22LR semi auto pistols very well. However, you should test this with a smaller amount before buying in bulk. Q: As someone who has very little firearms experience, is it a wise choice to have a rifle and handgun shooting the same caliber ammo for a potential SHTF experience? A: It is impossible to predict what will occur in such cases. It would be more advisable to choose firearms that will meet certain needs or defeat certain threats than it would be to standardize weapons on one caliber at the expense of all other factors. Generally, a rifle that fires a pistol or rimfire cartridge is the same size and weight, or nearly so, as a rifle that fires a centerfire rifle cartridge. The latter, however, offers greater range and power than the former. Q: what is the best grain load for hunting small game? A: 40 grain bullets work fine for hunting small game with .22LR. However, you might find that you can shoot at greater distances with higher accuracy if you use higher velocity 36gr or 29gr bullets. Q: Why is a .22 cal round not acceptable for hunting? A: Hunting what? .22LR is generally accepted as ideal for hunting small game without destroying meat. On the other hand, .22LR is not generally accepted as providing quick and human kills on animals over 10-12lbs. Q: What kind of velocity can I expect to obtain with a 3.5" barrel when using this ammo? The barrel in question is from a Walther P22. A: Velocities for this CCI ammo out of a Walther P22 should be just under 1000fps. Q: I'm new to shooting and purchased a 22 pistol to practice shooting a handgun inexpensively. Can you help me understand the qualitative differences between this CCI (relatively expensive) and some of the cheaper rounds, like the Federal Champion? On the surface, it appears that a round is a round and they should all be priced about the same and I'm just better off buying the cheapest I can get. I know there is more to it, but need some help. Thanks. A: You are off to a great start by buying a .22LR handgun for practice. 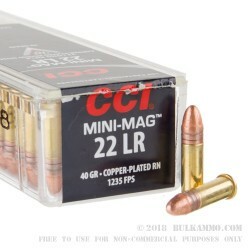 While they are not considered match ammunition, CCI Mini-Mags are highly regarded as being more accurate and reliable, especially in semi-automatic firearms, than standard bulk pack .22 LR - which is itself quite accurate and reliable. It is not likely that you would encounter problems with either type if you have a modern .22LR handgun, but it might be a good idea to try a smaller amount of each type before purchasing such a large amount of either.